The first phase of San Antonio's massive 400-MW Alamo solar project is now online, making it already the largest solar project in Texas and the first part of what will be the largest municipally-owned solar project in the U.S. When fully built out in 2016, the seven solar farms comprising the Alamo project will not only generate 400 megawatts of clean energy for San Antonio, Texas, they will also bring hundreds of permanent solar-related jobs to the region. Job creation and manufacturing were part of the requirements contained in the project's Request for Proposals (RFP) put out by CPS Energy, which serves 740,000 electric and 330,000 gas customers in Bexar County and parts of neighboring counties, in south central Texas. Although they are a rare provision in the U.S., manufacturing components are common as part of the Feed-in Tariff program in the Canadian province of Ontario, said Tony Dorazio, president and CEO of OCI Solar Power, Alamo's project developer. "The bad part is in some political arenas and state governments, they get these great ideas but then they can't drive it all the way home," he said. "But San Antonio and CPS made an effort to create a green energy industry around an area that's basically been oil and gas. 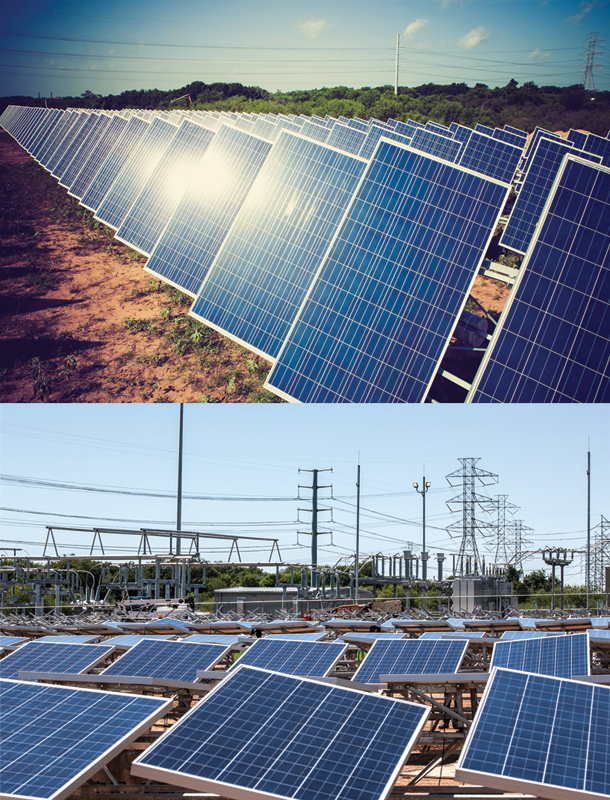 "They liked industries that wouldn't necessarily stay in solar, like engineering and construction, that could morph into the other sides of energy in Texas." Five manufacturers have joined OCI Solar in a consortium to bring as many as 800 permanent jobs to the San Antonio region. They are Mission Solar Energy, formerly known as Nexolon America LLC; ERCAM Trackers; KACO new energy inverters; Mortenson Construction; and WTEC. CPS originally had discussed a 50-MW project, but it wasn't large enough to attract the scale of industry the utility envisioned, said David Jungman, interim director of corporate planning and development at CPS. "So we got more aggressive and upped it to 400 MW," he said. "That's when we were able to get more bang for the buck on pricing and bringing in economic development." The project will be built in seven phases, with the first phase—the 41-MW Alamo 1—constructed on 445 acres in the south part of San Antonio. It was brought online in December 2013, making it the largest solar project in Texas. Considerably smaller, Alamo 2 (4.4 MW) and 3 (5 MW) will be built in highly visible locations near San Antonio to educate passersby and ratepayers on solar energy. The two smaller facilities also lend themselves to tours and school field trips. Ground has already been broken for Alamo 4, a 39-MW facility on 600 acres of private land near Brackettville, about 125 miles west of San Antonio. Alamo 5, 6, and 7 will be much larger, each likely in the 100-plus-MW range. They will be built in, as yet, undetermined locations in west and north Texas where the solar radiation levels are better, Dorazio said. The sheer size of the overall project compelled developers to spread out the solar farms to avoid overloading the power grid in any one location. The larger projects will be transmission connected whereas the smaller projects are distribution connected, Jungman said. The larger projects will be located where there's available capacity on one of the CREZ (Competitive Renewable Energy Zones) distribution lines in the state. The lines were originally built to handle wind-generated power in north and west Texas. The Texas clean energy scene has been dominated by wind. At the end of 2013, Texas was the top wind power state in the U.S., with 12,335 MW. But Dorazio says the state's peak electricity use patterns lend themselves to solar. "Mostly in west Texas, wind blows on the shoulders or nights when temperatures are changing. That's not when the power is at peak demand—between 11 and 4 during the day with the air conditioner loads," explains Dorazio. "We need to marry wind power with some on-peak stuff, and these solar projects do that. Plus solar has come down in price." Jungman said CPS was interested in large-scale solar because the utility likes to maintain a diverse generation portfolio, which includes power from nuclear, coal, natural gas, wind, and a small amount of solar. He puts the Alamo project in perspective by saying, "Four hundred megawatts sounds like a lot, but as far as our total generation, it's not great. By the time it's built, it will be four to five percent of our total generation. But still, that's a lot of solar generation." In addition, solar and other renewable energies will help the utility meet future carbon legislation. "I think our build-out of solar is going to help us manage the potential impact on CPS," Jungman said. "Already, we're one of the largest purchasers of wind [energy]." OCI Solar became involved in the project when CPS put out a Request for Proposals two-and-a-half years ago. More than 100 companies submitted bids, but Dorazio said the project wasn't your typical 400-MW power-purchase agreement, since the San Antonio utility also sought a jobs component. OCI Solar eventually won the bid, and Dorazio said he likes to think it was because of the overall breadth of the proposal. "We weren't just thinking of a panel manufacturer," he said. "We actually stated that we would create many vertical industries within San Antonio over the long term. "Plus our benefit was we were going to add basically everybody from welders, engineers, and accountants. We were again thinking about the whole value chain of employment and not just engineers, not just manufacturing people." In addition, the contract called for a 25-year PPA where CPS would be guaranteed a set price for electricity from the project. 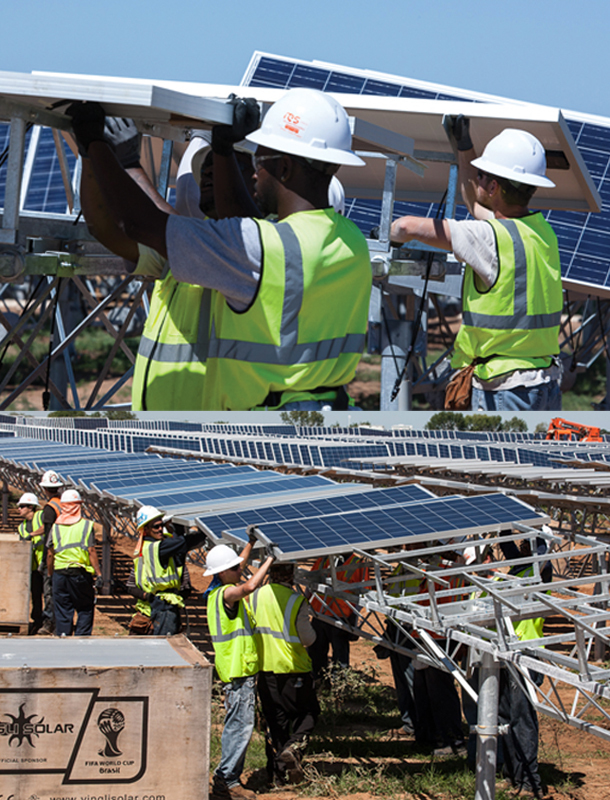 Constructing the 41-MW Alamo 1 solar farm was similar to building a manufacturing plant but on a much larger scale. The pure logistics of building on this scale is dramatic, with materials spread out over 450 acres. "We have a contract with OCI Solar, but we also feel like it's a partnership," Jungman said. "They're bringing clean energy jobs to San Antonio. We truly want to be known as the solar center of Texas, especially if they start building facilities in other parts of the state. It's a public-private partnership that will have an impact all across the state of Texas." The overall project will feature what Dorazio described as the "latest and greatest technology." Mission Solar's San Antonio manufacturing facility will supply 320 MW of panels to the overall project. But the firm couldn't get its new plant up and running in time to supply the first four phases, so OCI Solar went with a mix of panels from ReneSola Ltd. and Yingli. The first phase involves 167,680 295-watt N-type panels that are also bifacial. In addition, about half of the more than 4,000 trackers from ERCAM are dual-axis whereas the other half are single-axis. The topography of the 445 acres on which the project sits dictated the type of tracker, he said. The dual-axis trackers work better on the flat grade. "When you start getting into hills of two to three percent grade, you start getting more shading," Dorazio said. "So where we can, we'll try to use the best technology out there." Developing a solar project is much like any other large construction project, he said. The larger solar farms are being built on private land with long-term leases secured from the landowners. "Most of Texas is ranches that like to keep land in the families," Dorazio said. "We're good neighbors. We're very quiet. We don't bring out traffic after construction, so we're a good neighbor on top of the tax benefits. And we bring revenue to the area, so finding land isn't very difficult." Environmental reviews were conducted, and with Texas being a business-friendly state, he said securing the necessary permits wasn't difficult. After the ground was surveyed and the necessary cut and fills made, constructing the solar farm was similar to building a manufacturing plant but on a much larger scale, Dorazio said. "When you look at manufacturing, it might be large with 100,000 square feet but it's within four walls, and you can find the people," he said. "With this, it's not only managing staff, it's managing inventory. You have inventory spread out over 450 acres. The pure logistics of building something like this is pretty dramatic. Just the environment you're covering, you're moving dirt over 450 acres." The actual installation was similar to an assembly line, Dorazio said. One crew would drive the pilings, followed by a crew that would put the trackers together. Once those were completed, another crew would mount the trackers followed by yet another crew that would install the panels. Much like an intricately orchestrated ballet, another crew would trench in or hang the cables along the pilings. Once each section was completed, a commercial electrical crew would connect the string to an inverter. Altogether, the project involved 37 inverters, he said. At the peak, about 600 workers were on the ground. "So it was very much a manufacturing-style assembly," Dorazio said. "It's a lot different than constructing wind [turbines]." of Avon, Minnesota, will provide oversight for Alamo 2. Beyond that, Mortenson Construction will act as EPC. The Minneapolis-based firm is also part of OCI's consortium and plans to open a regional office in San Antonio the first half of this year. Although Alamo 1 required hundreds of trucks to deliver the materials to the site, they were scheduled throughout the duration of the project and during off-peak traffic. As a result, only about 15 trucks per day came and went from the site. Unlike wind projects, which typically require oversized trucks and pilot cars, Dorazio said the deliveries to the solar project used standard-sized semi-trucks. One of the take-aways from the project was the importance of communication among all the suppliers, he said. "When you have a panel manufacturer and a tracker and an inverter manufacturer that have never worked together before, it's just getting the delivery schedule to work," Dorazio said. Beyond Alamo, CPS doesn't have any solar projects on the table. The utility most likely will begin evaluating its resources and other possible projects in 2015 or 2016, once Alamo nears build-out, Jungman said. "With the balances we're trying to achieve, what's the next thing we should be adding?" he asks. "Is it more solar? Is it more wind? We try not to bring in too much of any one particular type."